Computer Viruses, Spyware, Trojans, and Malware – What’s the Difference? The scene reads like something out of an epic historical film - A roving band of criminal masterminds, heading through the sprawling countryside are stealing precious tomes that contain secret information of extreme value to their rightful owners. The lawless marauders hold each and every tome under a unique system of lock and key, and only they know the right way to unlock the system. If anyone else dares try to breach their locks, the systems will selfdestruct. Let’s go back to the shuddering victims. Each unfortunate one wants what is rightfully his or hers. They have worked years to cultivate the information in the captive tomes. In but a moment, all has vanished, taken from them. Each one also knows that he or she could pay up and go along their merry way, with their own tome safely out of the marauder’s hands. But they also know that by paying up, they are paving the way for more theft, more lawlessness, more corruption. Sadly, this is a question that thousands of people find themselves asking each day. 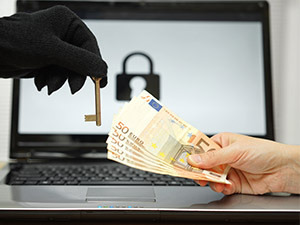 Ransomware, the hottest attack method for hackers at the moment affects upwards of 10,000 people in the US each day. Experts expect that number to increase over the course of the year and the unlock fee is usually between $400-600. From despair to a smile in less than an hour fantastic.Thank you . Thank you very much for retrieving many years of photos and documents which I'd thought I'd lost forever! Excellent and fast service. Highly recommended. To find out more about our services Contact Us.